For most of the 20th Century American public education was an exercise in mass production until world events revolutionized the globe and the pace of technology mandated this new century in which we live and where a better-educated America has become an absolute necessity of survival. 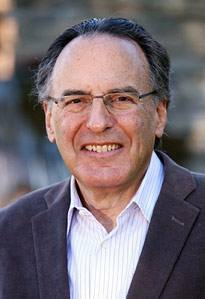 At next Wednesday’s Rotary meeting, speaker Harold Kwalwasser continues his campaign to renew America’s educational system and remake the way we educate our children, our grandchildren, and the generation who are the future of the united States. In a public service announcement that was met with groans and moans from the gathering, President William reminded everyone that property taxes were due today, April 10th, 2013. Paul Hamilton introduced our one and only visiting Rotarian, Stevenson Atherton from St Helena Rotary Club. Stevenson is a frequent visitor to our club. Greg Johnston, AJ Printing & Graphics, graciously accepted President Bill’s offer that he would not be fined for wearing flip flops to the meeting if he shared his Rotary Means Business Moment with the club. A co-owner of AJ Printing, Greg provides a variety of printing and mail services to his clients, commenting that this has been a very good year for AJ Printing. 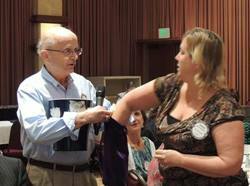 The economy is growing and he appreciates the business that Rotarians bring to his company. Not only was the sun shining outside but also is shining on our Rotary Club. There was nothing to report although one member (a retired doctor who shall remain nameless) was heard to complain that he had a headache. His Rx? Take two aspirin and enjoy the meeting. Trustworthy and always accountable, our club’s only Stone Age Past President Wally Lowry announced the Raffle Jackpot had grown to $744. Kerrie Chambers was gratified when guest speaker Glenn Campbell drew her “winning” number, but was unsuccessful in finding just one of the two Jokers in the velvet bag. She resumed her seat, still smiling and content with her $10 consolation prize. The pot continues to experience bullish growth along with the excitement at each meeting. According to the club’s “Raffle Experts”, the jackpot is expected to reach $1,000 soon, if there is no winner next week! 58 years ago this week, on April 12, 1955, medical experts announced that the Salk polio vaccine was “safe, effective, and potent.” Today, we are on the verge of eradicating polio, but the imperfections of humanity remain our greatest obstacle. Today, decades later, we are truly “this close”, but your support is still needed to cross the finish line. Debi Zaft, Past President and Rotary Powerhouse, reminded all Rotarians that April is Rotary Magazine month. Her goal—and ours—is to obtain 100 percent magazine readership. Debi asked all Rotarians to sign in on the list after you read the Rotary magazine. Most everyone remembers that Doug Johnson donated one of the major auction items to the club’s Casino Royale fundraiser—a murder mystery dinner. This past weekend, thanks to the talents and hard work of Chef Gesine Franchetti, the gourmet event took place. At today’s meeting, Doug presented Gesine with a bouquet of a dozen beautiful long-stem roses, on behalf of the World Community Services Committee. Thank you very much, Gesine. Paul Hamilton needs volunteers for the Hands on Project. This year the project will be Saturday, April 27th at the New Directions School, on Stony Point at Todd Roads. Volunteers will devote their efforts to two of the school buildings and will include general maintenance and the usual clean-up work. If you enjoy these hands-on projects, sign up at the next Rotary meeting on Wednesday, April 17th. Any questions that won’t wait, contact Paul Hamilton. He’s in the club roster. Katie Barr makes it look so easy! the membership drive $100 grand prize! Mindful Meditation: Thanks to President Obama’s latest gaff, mature men must be careful when introducing younger women, so all restrictions apply when welcoming back Katie Barr to the Rotary stage to lead us in another Yoga experience. This week Katie taught us ways to calm the nervous system through ujjayi breathing “the ocean breath”. She also demonstrated how to “open up your hips” in an easy yoga position while sitting in your chair. Easy? Sure…but some Rotarians discovered just how painfully stiff their leg joints had become since Katie’s last session of “Rotary Yoga”. After Wednesday’s busy meeting, Chair Doug Johnson reported that the Giro Bello cycling event set for Saturday, July 6th hit the break-even mark this week with almost $20,000 in registration fees from 133 dedicated cyclists. Matt Fannin tells The Santa Rosarian that sponsors from previous Giro Bellos are signing up again with close to $7,000 already deposited in the bank. you show up at the next Rotary meeting. 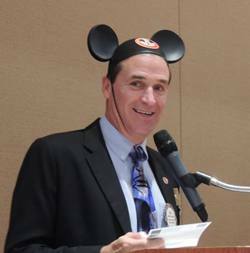 With less than three months remaining, our soon-to-be past president encouraged Rotarians to confess at the bargain rate of only $15. First up was Jeff Gospe who had been waiting weeks to present our leader with his own personally-engraved Mickey Mouse ears and a can of beer/wine cooler from Siesta Kay Beach. My, my President Bill, what big ears you have! Kerrie Chambers confessed that she recently returned from a trip to Kauai where she practiced for the Giro Bello, racing downhill on a bike down Wiamea Canyon. She had great luck when she spotted a two-day-old blue whale while on a whale-watching adventure! While in Kauai, Kerrie made up at the Kappa Rotary Club and watched an Ocean Water Safety video produced by the club for the many hotels & resorts on the island of Kauai. Kerri was impressed and suggested that Rotary might consider producing a public safety video on safe cycling in Sonoma County. 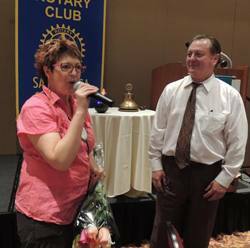 While she had the microphone, Kerrie challenged Greg Johnston with a new fundraising opportunity for our club. Here’s the deal: Her son’s Little League team, the Rincon Valley Indians, plays the Giants, Greg’s son’s team. Kerrie will donate to Rotary $5 for each and every Rotarian who attends that game. Plus she buys a hot dog and a soda for every Rotarian who shows up to watch that game on Friday, May 3rd. Sounds like too good of a deal to pass up. week introduced Rotarians to the technologies that make 3D printing possible. 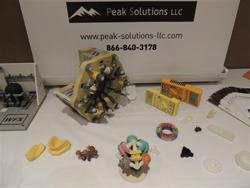 3D printing is a term, originally coined by Charles Hull in 1986, for a new process for making a physical object from a three-dimensional digital model. Developed 25 years ago by Scott Crump, the process assembles many successive thin layers of material that is cured by ultraviolet light as the process progresses. The layers can be as thin as .05 mm. It is also called “additive manufacturing” or ”rapid prototyping”, powered by software that allows a printer to take sectional slices of an object and then assemble the slices to recreate a model of the image. It reads the design from the image slices and then lays down successive layers of the binding agent which could be liquid, powder, or paper to build a model from these cross sections. What does it all mean to the non-techie Rotarian? Simply put, this is a way to manufacture almost anything using various technologies available through different software and printing machines. Because data, instructions, and processes exist in fully-flexible digital software, the benefits include drastic reductions in time needed for design, changes of design, manufacturing process, and identifying and correcting problems and errors. The process significantly reduces the time to market for a new product by reducing the cost of making prototypes. Innovation becomes virtually instantaneous because it can be seen immediately and changes can be made before costly manufacturing costs are acquired. In fact, it is estimated that manufacturing costs can be reduced by 50 to 80 percent. With extremely high resolution possible, accuracy down to microscopic size is no linger problematic. Up to 100 percent density can be achieved creating production parts not possible with conventional methods. Remarkably, the greatest acceleration comes integrating feedback from multiple parties working in parallel. Functionality of new designs can be tested and revised through practical, hands-on, applications. The future trends of this innovative concept appear to be limitless as customization becomes the norm, product innovation continues to accelerate, and newer, more innovative business models are realized. Today’s program was a captivating glimpse into the potential possibility of a future almost beyond imagination.